You’ve seen this happen many times. Once soaring businesses hit hard times and are faced with the prospect of shutting down. Elected officials, concerned about worker layoffs, extend the businesses cheap credit, buy their products, or otherwise subsidize the companies, to keep them afloat. It sounds like a humane economic policy. But is it really a good idea? Ian Hathaway of Ennsyte Economics and Bob Litan of the Brookings Institution have found that the U.S. economy has become less dynamic in the past three-and-a-half decades, with the new business fraction of companies falling from approximately 15.1 percent of American employers in 1977 to 8.1 percent in 2012. Intervention by paternalistic policymakers seeking to dampen the harsh effects of capitalism and prevent existing businesses from going under, may be responsible for the decline, at least in part. Rates of business formation and failure are linked. When existing companies go under, they create opportunities for entrepreneurs to start new businesses to meet demand in the newly underserved markets. Moreover, when businesses shut down, they free up capital and labor for new businesses to employ without requiring the new guys to pay a premium to bid those resources away from more established players. A look at U.S. Census data provides support for the hypothesis that depressed business failure rates are responsible for the decline in business start-up rates. Between 1977 and 2012, the per capita number of new employers founded annually in the United States correlates 0.56 with the fraction of existing employers that went under in the year. While that’s far from a perfect statistical association – a correlation of 1.00 means that two numbers move in perfect concert – it’s enough to suggest that the two numbers are related. In years where more American businesses went under, more American companies tended to get started, while in years where fewer American businesses shut down, fewer American companies tended to be formed. A cross-national comparison of business formation and discontinuation rates provides further support for this argument. Across 69 countries examined in the 2014 Global Entrepreneurship Monitor, an annual survey of entrepreneurial activity across the globe, the total entrepreneurship activity rate – the fraction of a nation’s adult age population that is either starting a business or is the owner-manager of a new business – correlates 0.81 with the country’s discontinuation rate – the fraction of the adult-age population that has shut down a business. As the figure below shows, countries that have a high rate of business failure also tend to have a high rate of business formation, while countries that have with a low rate of business discontinuation also tend to have a low rate of start-up activity. 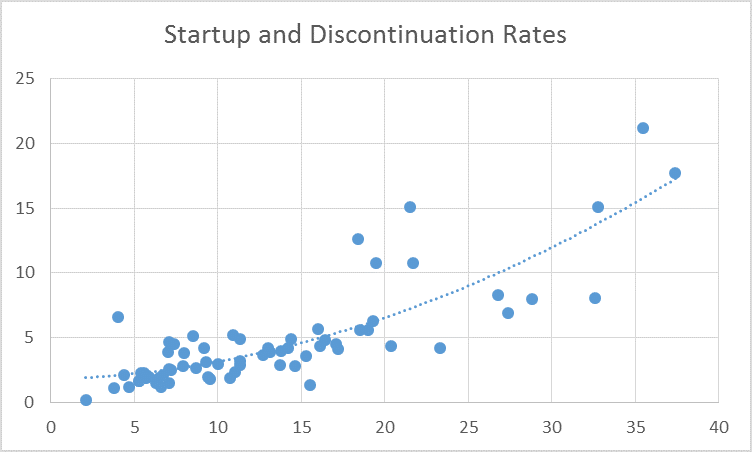 No countries have both high start-up and low discontinuation rates. The patterns described here are only correlations. Nothing in the Census or GEM data indicate that higher business failure rates cause start-up rates to rise. Nevertheless, the correlation between the two suggest that they are linked. Because our nation’s declining start-up rate has many observers worried, our elected officials should take a careful look at whether the policies they have undertaken in recent years to minimize business failure have inadvertently suppressed entrepreneurial activity.